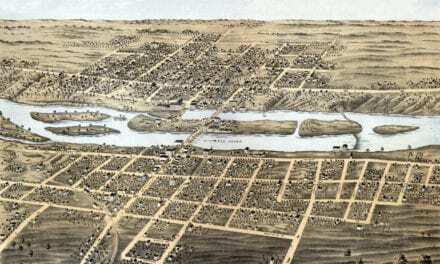 This map shows Chicago, Illinois as it looked when it was incorporated as a town on August 5, 1833. The map was created in 1933 by Walter Conley and O.E. Steltzer under the guidance of Caroline McIlvaine, a librarian at the Chicago Historical Society. It was compiled using data from an original “Map of Chicago about 1833”. 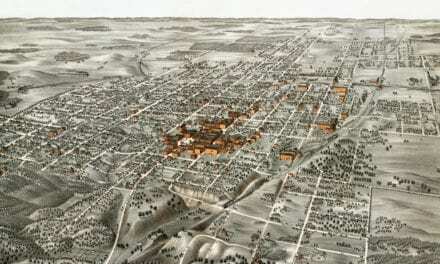 Mr. Conley, after a two year search of libraries and archives, aided in the compilation of historical details by Miss Caroline McIlvaine, who thirty years ago received from the last surviving pioneers their data as to the city of the thirties, laid out this accurate plan of the Chicago of 1833. 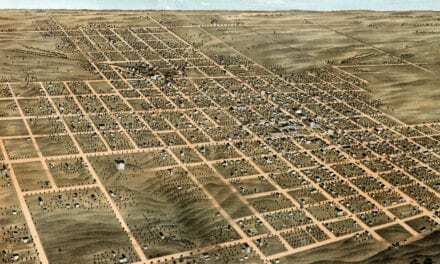 It will be seen that streets in what is now the loop bore then the same names they have now. The sketches which illuminate the map are as authentic as a careful search of historical data can make them. 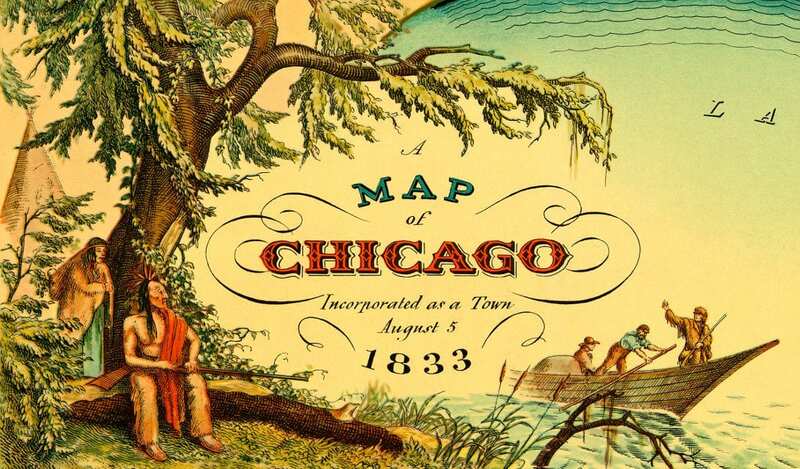 The map features fascinating pieces of Chicago history such as the first drawbridge to cross the Chicago River at Dearborn Street, the second Fort Dearborn, the site of the Dearborn Massacre at the foot of 18th street, the Road to Detroit and Sauganash Tavern, the first hotel in Chicago. 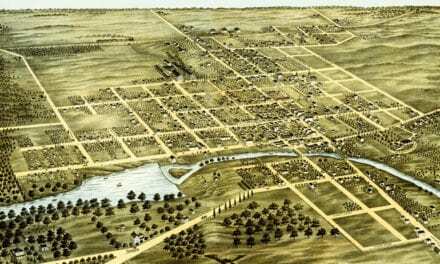 This historic map of Chicago has been restored by KNOWOL. Reproductions of the map are available here. 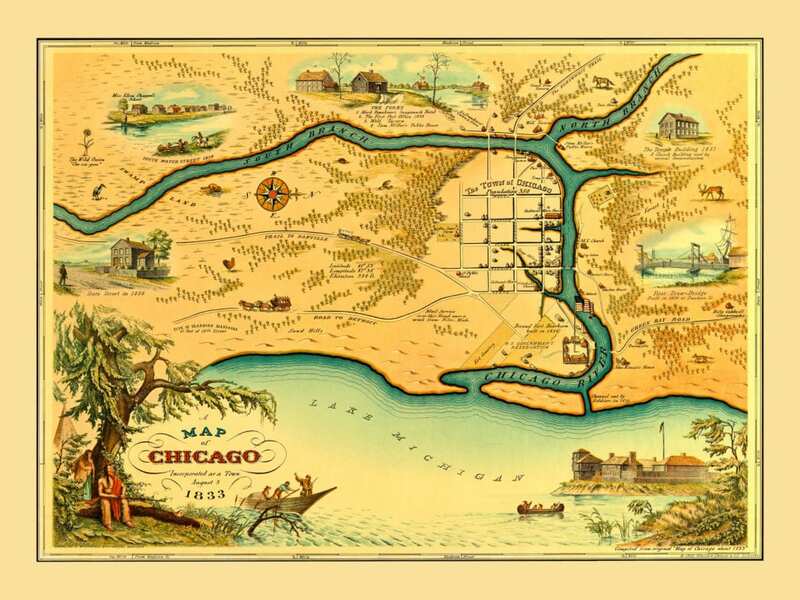 This historic map of Chicago will make an attractive addition to your office, library, or den, and can even be used to teach children the geography and history of the area. When you’re done exploring, click here to get your copy.